In Nevada, mud slinging has fallen out of fashion. 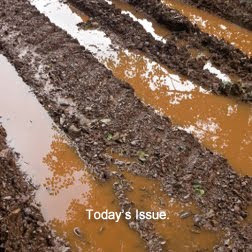 Nowadays, everyone would rather roll in the muck. In one of the more ridiculous campaign moves in recent history, Gov. Jim Gibbons sent out a press release that attacked primary candidate Brian Sandoval for a comment he made eight years ago. Sure, the answer to the question asked was absurd. And it showed Sandoval's complete and utter ignorance about the Constitution. But to burp it out in a release in an attempt to make it a platform plank can only be described as novice or perhaps desperate. A Brief Backgrounder On The Comment. With Nevada still moving in the wrong direction of economic recovery (Las Vegas unemployment is over 13 percent), one might think the priority would be jobs. You'd be wrong. This week's issue is about an exchange between the Las Vegas Review-Journal editorial board and Sandoval, who was running as attorney general at the time. According to the Las Vegas Sun's retelling of a Las Vegas Review-Journal story, it went like this ... Sandoval explained the AG is obligated to enforce any enactment of the Legislature, no matter how unconstitutional, columnist Vin Suprynowicz demanded: you’re saying that if the Legislature passed a law requiring all Jews to wear yellow Stars of David sewn on the outside of their clothing, you’d enforce it? ‘It’s my job to enforce it,’ said Sandoval. This was the focus of the Gibbons release. You can read it in entirety here. Ironically but not surprisingly, the release misses two valid issues — it would be a vile breach of the Constitution and ignores basic fundamentals such as the balance of power between legislative, executive, and judicial branches — and attempts to build a case for anti-Semitism. Reactions from Around The Race. Sandoval kept his response short. "Jim Gibbons' statement today is so repugnant it is beneath the dignity of the office of Governor," opened his three sentence statement. The other candidate vying for votes in the Republican primary, Mike Montandon, had even more fire. He called on Gov. Gibbons to apologize to Sandoval and the citizens of Nevada. The outrage has been as irrelevant as the initial blunder. Political columnist Jon Ralston offered the better response for the two candidates. "How about a lack of respect for anyone with a triple-digit IQ, no matter his or her religion, with the use of a repulsive analogy that was neither on point nor relevant?" And Steve Selebius offered the better round up, overall. At the same time, it seems nobody can leave it alone. The release and the comment has generated more media and blog headlines than any other story about the original comment and any other issue discussed in the entire race. Some claim anyone who compares someone to anything close to a Nazi has lost the argument. If only that were true. Nazi is the word of the day in Arizona too. Dozens of people opposed to the recent law in Arizona, including Nevada Democratic gubernatorial candidate Rory Reid, are comparing it to a Nazi policy. Interestingly enough, the media doesn't slap that analogy away. Nowadays, it takes a sports writer to offer up some semblance of reasoning against the rash of boycott. The Psychology Of Modern Politics. All of this demonstrates an increased reliance on angry voters, with politicians and special interests throwing up diatribe bait on a regular basis to see what sticks. Generally, the media loves it too (despite selective denunciations) because diatribe means ratings. The more colorful the controversy, the more it is covered. So what could have the politicians done instead? • Gov. Gibbons had a legitimate complaint in that Sandoval once said he would surrender the Constitution in favor of a populous vote. The initial comment had nothing to do with anti-Semitism as much as it had to do with being ignorant about our country. Had Gibbons merely probed to see if Sandoval had reversed his opinion, the release might have worked. • Sandoval could have used this opportunity to put the comment to rest. His response could have been a mix of Ralston's suggestion and an emphasis on the idea that he would not support an unconstitutional law as governor. He should just say he misspoke in 2002. The fact that he did not ought to trouble voters. • Mike Montandon should have just stayed out of it, despite still coming up third in the polls. If there was an opportunity here, it would have been to change the subject. No such luck. He jumped right into the muck. • Rory Reid was smart to stay out of it, especially given he jumped on the Gestapo comparison bandwagon too when talking about the Arizona law. Different puddle, same muck. When you add it all up, all four candidates help clarify there is a continuing slide in state politics. Instead of mud slinging, it's all about muck rolling. It's simple to do, nowadays. Make a puddle of muck, invite the media, and every candidate will dive right in. They can't help themselves.